For many years now, Thanksgiving Day celebrations, which are held on the 4th Thursday of the month of November every year, has been an extravagant affair. Being a public holiday in the US, a large number of the populace celebrate this festival throught the week with their family and friends. Dining out and takeaways are as overwhelmingly desired as cooking a turkey at home with it’s succulent trappings. This festival certainly provides restaurants food for thought, since they discern an opprtunity to spruce-up the Thanksgiving menu and observe the response of the market prior to Christmas. A typical Thanksgiving Day menu would include : a 18-22 pound turkey well roasted, home made stuffings, Cranberry Relish, Candied Yams, Mashed potatoes, Almondines, fresh-baked challah rolls, Apple pie and Pumpkin pie for dessert. Approx 70% consumers will spend on an average $35 or more. 51 million turkeys will be consumed in the US for this festival. Digital signage menu boards best option for POS locations for staying ahead of competition.Bright and glittering menu boards will always be aesthically atttractive and provide the desired perception of a ‘happening’ restaurant. Video and playlist facilities should be displayed at the opimum. Particularly when the menu items of most restaurants will be more or less similar. Moving and dynamic images of the menu, the decorated interiors ,and the promise of best service should entice customers. Digital content should be attractive for luring flying customers. Content should be clean, fun, entertaining. Good content adds value to a customer’s restaurant experience, which he would look forward to on this weekend. Pricing options, add-ons and up-sells should be displayed more prominently. These provide the real moolah for the restaurant. Lucrative schemes on combos plus differential pricing on meals would have the coffers ringing consistently. Product differentiation with respect to menu items in cooking styles and variety a big plus. Again, when most restaurants are offering similar menus on turkey, potatoes, cranberry, rolls etc , just that shade difference in quality would make all the difference in revenues. Business tie-ups with local events ; theatre, music, sports with coupon offers for patrons. Try to transact a win-win situation with local business partners, as well as with your customers. Tickets, discounts, coupons offer only on sales above a threshold level. Branding as with unique names on menu items : Harry’s turkey roast, Danny’s Apple pie etc. Branding, being a long-term marketing strategy,also helps when a unique feature of the business is highlighted for 3-day weekend, particularly when there’s Christmas to follow. Marketing the restaurant & menu on social media and customer’s smart phones. Given the personalized communications today, customers too expect the restaurants in their city to update them prior to a festive weekend. Posting relevant and updated content on facebook, instagram and smart phones would be a big draw on responses and footfalls. The Turkeys And The Feasts! Bob Evans : Features ‘Thanksgiving Farmhouse Feast’ with roasted turkey, smoked ham, cornbread and celery dressing, cranberry relish rolls,mashed potatoes with gravy, green beans with ham, macaroni with cheese, pumpkin bread& pie. For 8-10 people cost is $115. Boston Market offers traditional plated meal for $12.99 per person. The menu includes sliced roast turkey breast or a half signature rotisserie chicken, two sides, a dinner roll, a slice of apple pie or pumpkin. Additions like family meals, hot side dishes, and appetizers also on offer. Buca di Beppo offers Italian style cooking and very succulent items such as sliced turkey, roasted garlic mashed potatoes, spiy Italian sausage stuffing, green beans, cranberry sauce & pumpkin pie. Meals for three $68.99, and for five $134.99. Chart House has crafted a Thanksgiving Dinner menu that infuses local flavors with a touch of the exotic, resulting in one of the best. 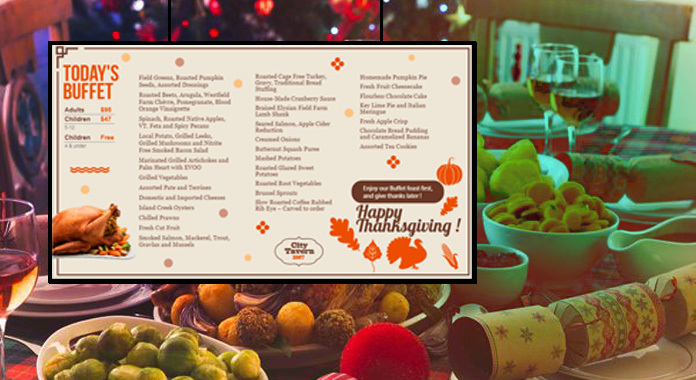 It is adorned by roasted turkey, special stuffing, mashed potatoes, cranberry relish, roasted veggies, pumpkin pie for $31 (plated) and $41 ( buffet). Cracker Barrel Old Country Store will offer the usuals in turkey, gravy, ham, cranberry, beverages, corn muffins, pumpkin pie. $12.99 for adults and $7.99 for children. Also offering carryout options; Meals for 10 costing $109.99 and Family meals in-store for $67.99. Denny’s : From now through Jan2019 it will serve a ‘Festive Flavors’ menu which will feature its classic ‘Turkey & Dressing Dinner’ starting at $9.99, with facilities of online ordering platform. The menu will have the specials along with a choice of two sides. Downtown Aquariums will present Thanksgiving dinners buffet-style at their various locations with an assortment of breakfast items,seafood selections and traditional favorites. Prices are around $40 for adults and $20 for children. Mitchells’s fish Market locations in Florida, Indiana, Kentucky, Michigan, New Jersey, Ohio, Pennsylvania and Wisconsin will serve plated Turkey dinners with traditional sides at $28 for adults and $10 for children.Also a full Thanksgiving dinner with all works at $129 (for 3-5 persons) and $250 (for 8-10 persons). There would be many others with special menus and offers. All with the objective of enhancing their business growth with fun and entertainment. We at DS Menu wish everyone a very happy Thanksgiving Day weekend. Let’s celebrate the legacy of thanks and feast that have survived the centuries. Cheers !